The latest outing by Finnish master filmmaker Aki Kaurismäki is a melancholy yet hopeful meditation on the plight of refugees in Helsinki – and by extension, the world. 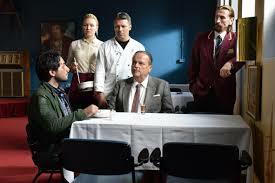 Kaurismäki’s effortless mix of deadpan black comedy, faux hipness and humanism have made him a perpetual favorite in international critics’ circles, and all these ingredients are on vivid display in the entertaining The Other Side of Hope. Wikström is a stolid fellow trapped, like so many of us, in workaday monotony. He ditches his alcoholic wife, sells his meager interest in his dress-shirt business, and takes the cash to a high-stakes poker game. It turns out poker is something Wikström is good at. Now seeking a new calling, he invests in a shabby, hopeless-looking restaurant. Meanwhile, a Syrian refugee named Khaled is turning himself in to the authorities, after ending up in Finland on a ship by mistake. Impassive Finnish helpers set him up in a busy refugee shelter, and he begins dutifully wandering through the bureaucracy required to gain asylum. Separated from his beloved sister en route, Khaled enlists the help of a generous fellow refugee to help find her. Mazdak, an Iraqi who has already been in the shelter way too long, knows how to get things done. As they run up against a cast of peculiar and inscrutable Finns, the refugees’ bewilderment is completely understandable. To Khaled’s disbelief, Finland rejects his case and announces he’ll be sent back to Aleppo. He goes on the lam and ends up sleeping amidst garbage cans near Wikström’s new hole in the wall. Startled to find a stranger there, the refugee and the native each give in to their natural impulses, and smack each other. But then a kind of understanding is reached: Khaled will sleep in Wikström’s storage space, and Wikström will employ him in his restaurant. Soon the restaurateur and his trio of oddball employees are colluding to help Khaled avoid deportation. Shot in garishly-lit, eye-popping color by frequent collaborator Timo Salminen, and production-designed by Kaurismäki himself, the film’s funky score features tunes by Tuomari Nurmio which add to its vibe.